People close credit cards for a variety of reasons. Sometimes, cardholders get so behind on their payments they feel they can never catch up so they close their account. If you're fed up with your credit card issuer, you might close your credit card to sever ties with the bank for good. Or, you might close your credit card simply because you don't want it anymore. It's important to know that closing a credit card won't make delinquencies go away and in some cases, closing a card could hurt your credit score more than it helps. Here are five credit cards that you should never close and why it's better to leave them open. 1. Don't close any credit card that still has a balance. When you close a credit card with a balance, your total available credit and credit limit are reported as $0. Since you still have a balance on that credit card with no credit limit, it looks like you’ve maxed out. 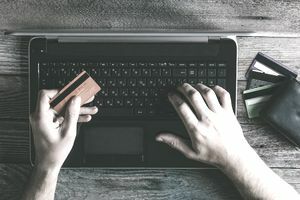 A maxed out credit card, or one that appears to be maxed out, can have a very negative impact on your credit score since your level of credit card debt, including your credit usage to available credit ratio, is 30% of your credit score. 2. Don't close your only credit card with available credit. Your only credit card with available credit is likely helping your credit score by lowering your overall credit utilization. Closing this card will leave you with more credit cards that have balances an d higher credit utilization. Just like closing a credit card with a balance, closing one without a balance can also affect your credit score, because you've used up all the credit that's available to you. 3. Don't close your only credit card. Since part of your credit score (10%) is based on the different types of credit you have, keeping at least one credit card in the mix will add points to your credit score. Leave your only credit card open to show that you have experience managing various types of credit accounts. You should definitely leave the card open if it's the only active credit account you have and you're working to rebuild your credit history. 4. Don't close your oldest credit card account. Closing out old credit cards shortens your average credit age, which is 15% of your credit score. Lenders tend to view borrowers with short credit histories as riskier than borrowers with longer histories. Closing your oldest credit card won't impact your credit score immediately. But, once the credit card falls off your credit report several years down the road, you might see an unexpected credit score drop. 5. Don't close the credit card with the best terms. Why let a good thing go? If you have a credit card with a low interest rate, no annual fee, and other perks like travel insurance or great rewards, keep it. A credit card that charges you less for making purchases is far better than one that charges you more. Compare your current credit cards to a few others on the market right now. If you have a credit card with better terms, it's better to leave it open. It’s ok to close a newer credit card that you no longer use as long as the card doesn't have a balance and you have other credit cards. Or, you might close a credit card that suddenly raises your interest rate or introduces an annual fee once you pay off any outstanding balance. Your credit card issuer will probably close the credit card for you if you decide to reject these new credit card terms. Finally, in identity theft and fraud situations, your creditors will advise you to close the credit card to keep the thief from making fraudulent charges. Always close a credit card by sending a written notice to the card issuer. You can call first to cancel your account, but always follow up with a letter confirming your desire to have the credit card closed. You can make sure the credit card is reported as "Closed" on your credit report. It won't necessarily hurt your credit score if the credit card continues to be reported "Open," but double checking will ensure your card is indeed closed. You should be just as selective about the credit cards you close as the ones you open. Before you pick up the phone to alert your creditor that you want to close your account, make sure it’s not going to affect your credit score in a negative way.